Meant to write this in time for #tbt and International Women’s Day. This photo shows my great-grandmother Dora Stoler (l), her daughter Rochele, and her first husband and my great-grandfather Zvi Hirsch (r) and her mother Maita Abramowitz (standing), probably taken in 1917 before my great-grandfather was killed in the marketplace by a soldier on a horse. It’s hard to imagine what people’s lives were like back then. 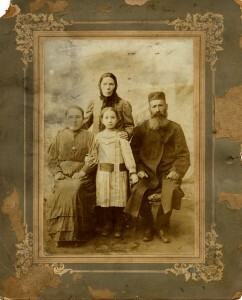 And my great-grandmother, from what I can tell, was clearly what we call “indomitable.” The Stollers lived in Karelitz (known today as Karelichy in Belarus) and the town, like many towns in that area, suffered the ravages of pogroms, World War I, a revolution or two, and then a civil war and a war with Poland. By 1921, her son, who had come to America, had to locate her and her daughter via the Red Cross. My mother told me that when they were finally found, “They were surviving on potato peels.” There was also a famine in those years, and the Russians were happy to let other nationalities starve. Most third-generations think that everyone back home was poor, but indications are, she might have had some money back home. That’s often why people didn’t come here. They might have been better off not working like a dog here. In the 1950s, a man showed up at my grandmother’s house to say that he had been a servant to the family back in Karelitz. Poor people don’t have servants. My grandmother gave the man my late grandfather’s tools so that he could work here. Stoliar in Russian means carpenter, and many in the family were carpenters. My mother recalls that when Dora Stoller came to America finally, the first thing she did was complain to my grandmother that she wasn’t rich already. “If I had come to America when you did, I would have owned all the property by now!” Not the words of a poor woman. It has been hard to find records for Dora. She appears on no census records, nor does her son. She wound up living with her son and his family at some point, driving his wife crazy. When Uncle Ben died of his mustard gas injuries in 1934, she “blamed” his wife, who promptly cut Dora out of her life and her daughter Toby. Dora married at least once more, if not twice more, while here. Her second husband was Wolf Mechanic. Wolf lost his first wife in March 1930 and by August he was marrying Dora. On her wedding certificate and her marriage license, she signed her name in English AND in Yiddish, which I have never seen anyone else do in America, and I have seen many death certificates. Life in America was not easy. Her youngest daughter, Rochele, had some sort of mental illness. Possibly PTSD from seeing her father killed, or worse. Rochele got married and had children, but at some point she wound up hospitalized, and her husband was notoriously alcoholic. Her two sons wound up in foster care, and not with family, which is odd. I have found no record of this third marriage. It’s possible she never married him but said she did. Either way, by the late 1940s she was living with her daughter. She probably had Alzheimers. She would wander, but a cousin told me, “a little girl at the end of the street caught her before she hit Coney Island Avenue.” And she wound up dying in a hospital on Wards Island in 1950. She is buried in the Karelitzer Society’s plot at Mt. Judah. It’s hard to imagine what her life was like. But she seemed to be a real survivor and she knew who she was and had a real sense of herself and where she came from. And she shared that with a grandson who for whatever reason was taken from the family while his mother languished in institutions. And, she was an immigrant.